Fractured Rib: Causes, Symptoms, Diagnosis and Treatment, Cracked Ribs – Do I have a broken rib? Your rib cage provides protection of vital organs namely your lungs and heart. Although rib bones are strong being attached together by sturdy muscles, you could suffer a fractured rib should you receive a robust hit to your chest. If you believe you may have a fractured rib, it is vitally important that you seek medical attention as soon as possible just in case you end up with a punctured lung. What are the Key Facts to a Fractured Rib? What are the Common Causes of a Fractured Rib? What are the Symptoms Associated with a Fractured Rib? How is a Fractured Rib Treated? When Should I Seek Medical Attention for a Fractured Rib? Could I Qualify for Free Orthopaedic Assessment for a Fractured Rib? What Free Private Treatment Could I Get For a Fractured Rib? How Should I Care for My Fractured Rib Once Home? Could I Qualify for any Other Effective Free Treatment for a Fractured Rib? Should I Keep Follow Up Appointments for a Fractured Rib? How Long is the Healing Process for a Fractured Rib? Can I Recover Safer and Possibly Faster From a Fractured Rib? Is the Prognosis for a Fractured Rib Good or Bad? Are There Any Complications Associated with a Fractured Rib? What Long-term Health Issues Can Occur with a Fractured Rib? I Think My Doctor Missed Something When Treating My Fractured Rib, What Should I Do? If you suffer a fractured rib, you would typically be in a lot of pain and discomfort. 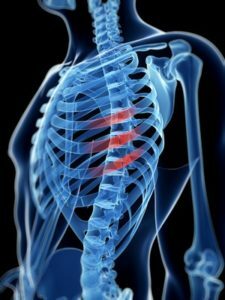 Any sort of injury to your rib cage could make breathing difficult and if a rib is badly fractured, you may even end up damaging internal organs. This type of injury is quite common more especially if you suffer any sort of trauma to your chest whether it is through a fall, a road traffic accident or due to a hit while playing high impact, contact sports. A lot of the time an injury to your rib would involve a “crack” which although painful, is not as serious as a broken or fractured rib. 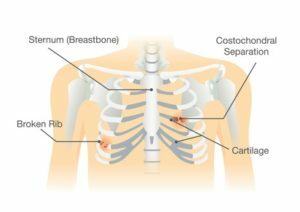 The reason being that a piece of broken rib bone can negatively impact your blood vessels and/or puncture your lungs and other internal organs which are normally protected by your rib cage. It can take anything up two months for a fractured rib to mend and heal. Having enough pain control during the recovery time for a broken rib is essential to avoid developing any complications which includes pneumonia. If you suffered a fractured rib and would like to know if you would qualify for free private treatment and free physiotherapy in your area, please get in touch with one of our health experts today. To find out if you would be entitled to free private fractured rib treatment in your area, please contact us today. Call us today to find out if you would qualify for free private fractured rib treatment in your area which includes free private physiotherapy which could help speed up your recovery. Treatment for a fractured rib involves effective pain relief so that you can breathe, swallow and cough properly without experiencing too much pain and discomfort when you do. The doctor would recommend the type of pain relief you should take during the healing process for a fractured rib. If you are susceptible to chest infections, the doctor would make sure you are prescribed the correct pain relief medication. It is essential that you follow a doctor’s directions when it comes to taking pain relief medication for a fractured rib and to never exceed the recommended dosage. If you experience any of the above, it could be that a fractured rib has damaged internal organs which includes your lungs, spleen or liver in which case you must call 111 if you cannot speak to your doctor and are not sure what you should do. If you sustained a fractured rib whether in a road traffic accident, while playing a contact sport or when you were doing anything else, you may qualify for free private physiotherapy and other treatment in your area. To find out what you may be entitled, to, please get in touch with one of our health experts today and we would be able to let you know straight away. Having been treated in your local NHS hospital for a fractured rib, an official broken bone report would have been done detailing your injury. You may be entitled to a free orthopaedic assessment of your broken bone report. You could also qualify for free private fractured rib physiotherapy in your area which goes a long way when it comes to speeding up your recovery time. Call us today and we can let you know in minutes whether you qualify for any free private treatment for a fractured rib in your area. Once a doctor has established you have a fractured rib, the main goal of any treatment is to ensure you are made as comfortable as possible and that you do not have any trouble breathing which is achieved through effective and safe pain relief medication. As previously mentioned, it can take around 4 weeks and maybe a little longer for a fractured rib to mend depending on the severity of your injury. During your fractured rib recovery time, it is important that you are able to breath normally because if you cannot, you may find that you shallow breath and not cough when you should. This can lead to a chest infection developing. If you are prone to chest infections, are a smoker or you suffer from persistent, chronic chest infections like COPD (chronic obstructive pulmonary disease) or you are susceptible to heart failure, taking the right kind of effective and safe pain relief, is essential should you have suffered a fractured rib. It is important to do these exercises during the recovery period as they help reduce the risk of developing pneumonia or suffering from a collapsed lung. Your doctor would tell you when you could return to work or carry out normal daily activities which includes any sports you enjoy. You may qualify for free private fractured rib treatment in your area as well as free physio which would help get you back on the road to recovery sooner. Although NHS fractured rib treatment is good, it is never as good as the care and treatment you receive in a private health facility. Call us today to find out if you would be entitled to any free private health care for a fractured rib in your area, we would tell you in minutes whether you qualify. You should always keep follow up appointments if you suffered a fractured rib which allows a doctor to keep a check on your healing process and if there are any complications, they can be caught early making them that much easier to treat and heal. In the majority of cases, a fractured rib heals in anything from 4 to 6 weeks, depending on the severity and complexity of a fracture. With this said, it is important that you take the right kind of pain relief which a doctor would recommend or prescribe. It also helps to keep as active as possible and to do breathing and gentle coughing exercises. You should not stay in bed or remain inactive during a fractured rib recovery period which could lead to complications and you may run the risk of developing pneumonia. It is worth noting that people most at risk of suffering complications having sustained a fractured rib, are asthma sufferers and people who have been diagnosed with emphysema. There are treatments and therapies that would help speed up a fractured rib recovery time which includes physiotherapy. To find out if you would qualify for free private fractured rib therapy and care in your area, please contact us today and we would be able to let you know in minutes the sort of free treatment you may be entitled to receive. The prognosis for a fractured rib depends on the complexity and severity of an injury and how much damage has been caused to internal organs. If you suffered a slight fracture, you should make a recovery in anything from 4 to 6 weeks. However, more severe injuries to your ribs could see the healing process taking a lot longer, more especially if a bit of fractured bone punctured your lungs, important blood vessels or other internal organs. Any sort of rib fracture is painful whether the injury is slight or more severe and if not cared for and treated correctly, you could suffer some serious complications. If you are unable to breath normally, you run the risk of developing pneumonia. Statistics show that around 35% of people over the age of 65 who suffer a fractured rib develop pneumonia. With this said, other long-term damage can be done to your lungs should a fractured rib bone have punctured them. If you think that your doctor may have missed something or incorrectly diagnosed your injury, you should find out as much as you can about a fractured rib injury, how the injury is diagnosed and treated to establish if you are right. The links at the bottom of the page provide essential information about fractured ribs. If you sustained a fractured rib and are not happy with the NHS treatment you received, please contact us today to see if you would qualify for free private fractured rib treatment and therapy in your area. You may be entitled to a free orthopaedic assessment of your fractured rib broken bone report or you may qualify for free physio for a fractured rib which would help speed up your recovery. It only takes a few minutes to find out if you qualify. You can call us on TEL NUMBER, or you can request a call back by filling out the form provided and one of our health experts will get back to you as soon as possible.